We think we should be able to satisfy our desires at all costs. Any time we can’t immediately obtain what we want, it feels like we’re experiencing something burdensome. While this is the norm of society at large, it doesn’t make it the best thing for us. Sure, there are major benefits to being able to do things more efficiently. I love productive systems as much as the next person. Organization means I can better enjoy time with the people I love. But even with the benefits of new technology and quick access, there are negative consequences for us as people. Believing we can do and have whatever we want whenever we want is prideful.Click To Tweet We end up taking God and His will out of the equation when we get into a place of perpetual striving. While experiencing life with chronic illness, I have taken a step back to analyze this societal conundrum. When I’m in sick, stuck in bed, and without any guarantee of how long it’s going to take to get better, I begin to recognize my weakness. I see that just because society tells me I can have what I want when I want doesn’t mean it’s the best thing for me (or that it’s even possible). Until getting sick to the point of debilitation with Chronic Lyme Disease, I was a self-sufficient person. I was a Christian. I loved the Lord and had a desire to follow Him wholeheartedly, but my pride kept me from embracing true rest in Him. As God began to work in my heart and draw me closer to Himself, I recognized my need to let go of my expectations for how life should be and surrender to Him and His will. And you know what happened? Everything changed! The world tells us we should seek after the good things of life (the blessings), but God tells us we should seek after Him (Psalm 63:1-3).Click To TweetWhat will truly fill us and curb those cravings is God. He meets us just where we’re at and fills our souls. The past few years of my life have been full of waiting. Waiting to find a good guy to date, waiting to find the right job, waiting for doctors appointments, waiting for medical test results, waiting to see glimpses of improved health, waiting to get married. Over and over, the waiting continues. You may be able to relate, because it feels like many of us who are facing difficult health challenges seem to do a whole lot of waiting! Recently, I started to see light at the end of the tunnel in one of the areas of waiting. My boyfriend, Jonathan, asked me to marry him and I, of course, said “YES!” We’re getting married in a few short months, and we couldn’t be happier! The proposal and engagement season have seemed so much sweeter than I ever imagined, and I believe a big reason for that is because we waited. We didn’t jump into marriage. Jonathan stayed with me through the deepest valleys of chronic illness and we came out of the darkest parts together, as a team. Even more importantly, throughout the time of waiting, I got to know God in ways I never had before. With delayed gratification, we can learn a lot. The waiting season isn’t always a hardship. It’s often the place God teaches us about what it means to depend on Him. In Jonathan, I have everything I ever wanted in a life partner. I feel incredibly blessed! But even so, I know that he can never fulfill all my needs in the way God can. Jonathan and I have a lot of fun, we love each other deeply, and we have the same vision for what it looks like to honor God with our marriage. But that doesn’t mean Jonathan can be my source of full support. God has to be the one I cling to the most. He has to be my source of hope! I’ve come to recognize waiting as a means of further understanding God’s grace. Delayed gratification can be a blessing because it gives us opportunities to more firmly cling to God. If you’re struggling with waiting for treatment to work or for symptoms of chronic illness to be alleviated, please know that you don’t have to walk through this tough season alone! 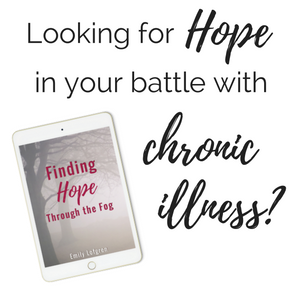 Grab your free copy of my eBook, Finding Hope Through the Fog, and join our email community of hope!